Earl began learning ASL in the early 1990s in his hometown of New Orleans, LA, when his sister (now an RID-certified interpreter in Brooklyn, NY) began learning ASL to be able to communicate with a Deaf girl who attended worship services in their congregation. 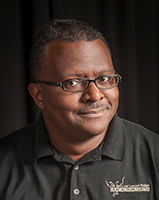 In the process of obtaining an Associates’ Degree in Drafting from Delgado Community College in New Orleans (1993), Earl took ASL I and II, which only strengthened his desire to delve deeper into his Deaf studies. In January 1995, Earl relocated to Patterson, NY to serve as a volunteer at the Watchtower Educational Center. He regularly associated with the Deaf communities of upstate New York and Connecticut, where his knowledge of ASL was expanded and refined. He initially worked with the Audio/Video department on ASL drama projects as playback operator, later serving as camera operator and proofreader for several ASL programs. Working with on-camera Deaf talent and off-camera Deaf translators, Earl interpreted stage directions, seminars, and other programs. His duties also involved contacting Deaf talent and organizing casts for ASL Bible dramas, and assisting with storyboarding, direction, and editing of ASL video productions. In late 2006, Earl and his wife moved to the Dallas/Ft. Worth area, where he earned his BEI certification and interpreted for various colleges and interpreting agencies, including training with Sorenson VRS. In August 2012, Earl, his wife, and 3-year-old son relocated to Shreveport, LA, where Earl currently serves as a Staff Interpreter at The Betty and Leonard Phillips Deaf Action Center. Now that the preoccupation of relocating and welcoming a second child into the world has somewhat subsided, Earl will pursue his RID certification to better serve the Deaf community – and because he simply cannot allow his older sister to beat him at everything.